Letter from Yogi Bhajan's Secretary of religion Sat-Kaur Khalsa, to all Yogi Bhajan "Sikh Dharma ministers"
"The Sikh Dharma Ministry in The Aquarian Age"
Yogi Bhajan's Secretary of religion Sat-Kaur Khalsa, reveals in a letter to Yogi Bhajan's "Sikh Dharma ministers" how 3HO's "Kundalini Yoga is sacred and transformational rather then an exercise class?". 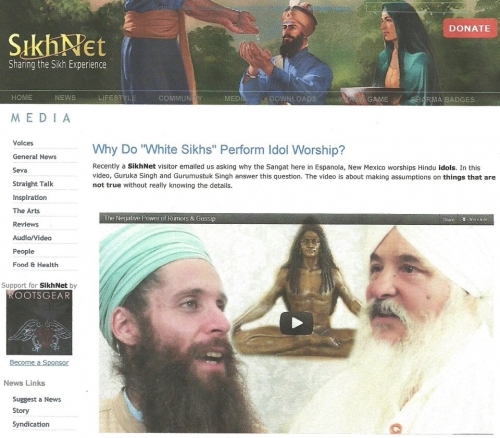 Sat-Kaur equats the practice of Bhajan's Kundalini yoga with a "sacred" religious "practice" when she tells her "Sikh Dharma Ministers", "What are we doing to foster those teachings(Yogi Bhajan's teachings or as 3HOers call him Siri Singh Sahib),share them, teach them, and uplift those with whom we interact?" Is this proof that Yogi Bhajan's "ministers" only want to induct innocent young Sikhs & yoga students into their Yogi Bhajan cult? Cult expert Rick Ross cautions: "..if you see some guru's picture on the wall, or religious statues in the entrance area or practice room, something more than yoga might be lurking within the instruction...A group with a hidden agenda can use meditation to download its program" (http://www.cultnews.com/?cat=2). If Yogi Bhajan followers really would analyze the odds, traditional Sikhi offers the best "bet" here in my humble opinion. If you ask me, Bhajanists are taking a huge risk & gamble betting their lives into infinity on a horse like YB that has a poor track record to say the least.